How would you like some fox with that udon? Don't worry, I promise you there is no fox in this udon. In Japanese, fox colored is often used to describe the brown color in food. The English equivalent would be golden brown. But it's not really because of the color that kitsune udon is called that, although that may be one reason why. 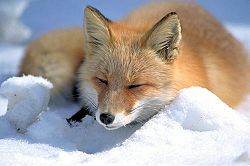 Foxes are thought of as mischievous animals but have often been revered as helpers of the Gods. This was originally because they provided a solution to the rodent problems and helped rice farmers with abundant harvests. The Inari shrines were built as a place to pray for abundant harvest and therefore, the fox is represented in these shrines. For whatever reason, because foxes are said to like abura age (fried tofu), abura age and inari sushi are often left at Inari shrines as an offering to them. Next time you eat your kitsune udon, remember that it's an offering to these foxy friends. 1) Boil some water in a pot and add the abura age to it. Cook for about 2 minutes to boil some of the oil out so that it will absorb the sauce when you cook it. 2) Drain the water and squeeze some, but not all the water out. You can lightly press your chopsticks against it to drain some of the water. The reason you don't want to drain all of it is because you'll drain all the nice tofu flavor along with it. 3) Add the soy sauce, mirin, sugar and dashijiru. Simmer for 15 minutes. Boil your abura age in hot water. After simmering in the sauce it should be a nice golden brown color. Top it on your udon along with chopped spring onions.